Back in June, my middle child turned fourteen. Just prior to that, we visited the Cheesecake Factory during our summer vacation to California. So when it was time for him to choose a birthday dessert, he already knew what he wanted–a cheesecake cake. 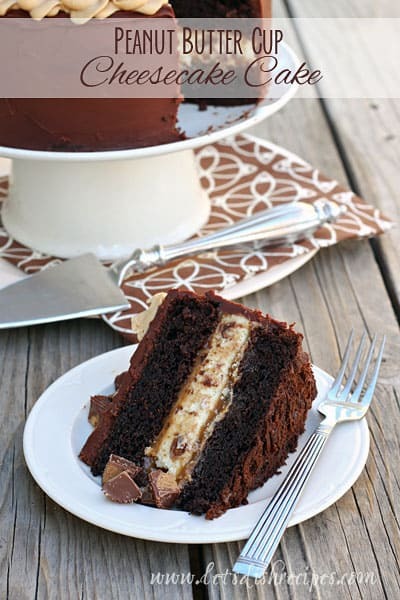 And since he loves chocolate and peanut butter, this Epic Peanut Butter Cup Cheesecake Cake was the logical choice. Honestly, I didn’t know if I could pull it off. Turns out, with a little help from a chocolate cake mix, it wasn’t too bad. And my son was thrilled! A few tips: start with a cake mix. There’s enough going on in this recipe that you’ll be doing yourself a big favor by taking a few shortcuts. I doctored my cake mix up a bit, which turned out to be a good idea–a more dense cake layer really does help the stability of the entire dessert. It also really helps to freeze that cheesecake layer before assembling the cake. It’s much easier to move it around and position it on the cake when it’s frozen. And I did end up shaving off the sides of my cheesecake a bit to match the chocolate cake layers, but that’s okay. It just means you get to test the cheesecake ahead of time. I did make a chocolate ganache frosting for this cake, but if you wanted to simplify further, you could certain use a prepared frosting. To make the cheesecake layer: place a 9×13 inch pan on the bottom rack of your oven. Fill the pan with a few inches of water. Preheat the oven to 325 degrees. Spray a 9-inch springform pan with non-stick cooking spray and line the bottom with parchment paper. With an electric mixer, beat the cream cheese, sugar and salt on medium speed until smooth. On low speed, mix in the eggs, one at a time until well blended. Mix in the vanilla and sour cream. Fold in the chopped peanut butter cups. Spread the batter evenly in the springform pan. Bake for 45-50 minutes or until the cheesecake is set. Cool on wire rack for 10-15 minutes. Cool for one hour, then place the cheesecake in the freezer for at least 2 hours. To make the chocolate cake layers: preheat oven to 350 degrees. Grease and flour 2 9-inch round cake pans. In a medium bowl, beat the ingredients for the chocolate cake until smooth. Divide the batter evenly between the prepared pans and bake for about 30 minutes, or until a toothpick inserted in the center comes out clean. Cool completely. To make the ganache frosting: combine the cream, sugar and corn syrup. Bring to a boil over medium-low heat, whisking until the sugar is dissolved. Remove the pan from the heat and add the chopped chocolate. Whisk until the chocolate is melted and smooth. Stir in the chopped butter until completely melted. Transfer the chocolate mixture to a bowl and cool until spreadable, stirring occasionally. The chocolate should be cooled to a frosting-like consistency. To make the peanut butter frosting: Beat the cream cheese and peanut butter with an electric mixer until smooth. Mix in the vanilla and salt. Add the powdered sugar, one cup at a time, mixing until smooth. If needed, add milk a tablespoon at a time until frosting reaches desired consistency. To assemble to cake: Place one chocolate cake layer on a cake platter or large plate. Spread 1/2 cup of the caramel apple dip over the chocolate cake layer. Remove the cheesecake from the springform pan and place over the caramel layer (you may need to let it sit at room temperature for 5-10 minutes first). If needed, trim the cheesecake layer with a sharp knife so it is the same size as the cake layer. Spread another 1/2 cup of caramel apple dip over the cheesecake layer. Top with the remaining chocolate cake layer. Spread the chocolate ganache frosting evenly over the entire cake. Using the peanut butter frosting, pipe a decorative edge around the top of the cake. (Alternately, you could just spread a layer of peanut butter frosting over the top of the cake. The decorative options are really up to you). Top the cake with additional chopped peanut butter cups, if desired. Who Dished It Up First: Recipe inspired by the Cheesecake Factory and this Black Forest Cheesecake Cake from Barbara Bakes. She has some great step-by-step photos of the assembly process. This is definitely epic!! Looks fantastic. Please let me know what size cake mix was used. They used to be 18 ozs. but now are 15 ozs. I would love to make this soon and would appreciate your letting me know the cake mix box size. Thank you in advance. This looks incredible and tasty and I’ll trust you that it’s not too difficult! Your frosting is what caught my eye! It’s gorgeous! This really is one epic cake! Oh. My. Heavens!!! This is positively amazing! 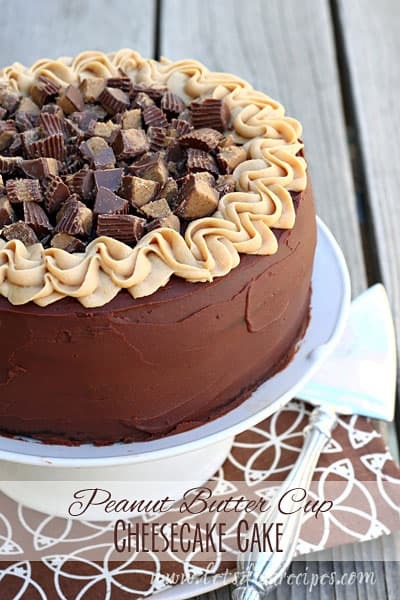 PB and chocolate is my favorite combo, and I can imagine this as my own birthday cake. I might not share!! Wow! Just Wow! Everything I love in a dessert! I plan to make this! This cake looks gorgeous! I plan to make it for one of my friend’s birthday in a few weeks. Did you have any trouble with the ganache almost not being enough? Also, roughly how much frosting does the peanut butter frosting recipe make? Please let me know, and thank you! Samantha, it has been almost 2 years since I made this for my son’s birthday, so I am trying to remember as accurately as possible, but I don’t remember feeling like I was short on the ganache. If you look at the photo of the cake slice, you can see how thick it is. I really don’t know how much peanut butter frosting the recipe makes, but it was enough to do that piping around the edge. I don’t think I had a lot left over, but I honestly don’t remember. Sorry I can’t be more help, but I am sure the amounts I used did work to make the cake. You could always make extra if you are worried about having enough. It turned out great! My friend even said that it was the best cake she’s ever had, so thank you for the amazing recipe! Yay! I’m so glad. 🙂 Thank you! When making cheesecake did you put the spring form pan in the pan with water or rack above it? I am wanting to make this in a couple weeks for husbands and sons birthdays. My husband loves cheesecake and they both love chocolate and peanut butter so this will be perfect. I put the pan of water on the lower rack and the cheesecake on the middle rack above it. You can also put it right in the water but I find it works just as well to keep them separate and you don’t have to worry about water leaking in. And really, since the cheesecake will be sandwiched in between two cake layers, you don’t have to worry too much about the top of your cheesecake cracking (which is what the pan of water is for). So the method you use isn’t quite as important in this case. Hope that helps and it’s a hit for your upcoming birthdays! I made this for the birthday party and everyone loved it, especially the the two birthday boys. The cake looked beautiful and tasted delicious. I did use a prepared chocolate whipped frosting instead of the ganache, as you a suggested to simplify the recipe a bit more. Thank you so much for the wonderful recipe. 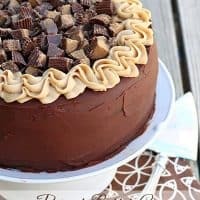 My husband’s favorite candy is Reese’s, so I made this cake for his birthday. It was AMAZING!!! I followed the recipe exactly and it turned out perfectly. It was a big hit at the party! Thanks for a great recipe!